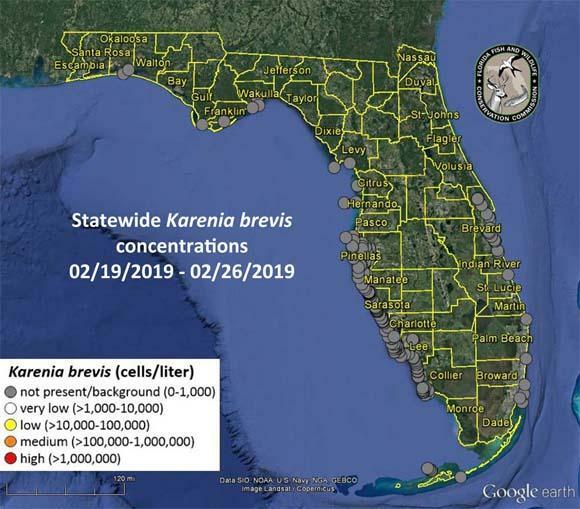 This graphic shows where the red tide organism Karenia brevis was most recently observed in southwest and northwest Florida. The environment wasn’t a priority under former Governor Rick Scott. Florida’s new governor, Ron DeSantis, is taking a different approach - and raising eyebrows - as he seeks massive dollars to clean up the state’s water ways. Now it's up to the Legislature to consider his funding request. Two days after he was sworn into office, Gov. DeSantis signed an executive order. Among other things, it calls for $2.5 billion over the next four years to help solve environmental concerns. “That represents $1 billion more than the previous 4 years,” he told a crowd in Bonita Springs. Specifically, DeSantis wants $625 million to focus on water quality and Everglades restoration. He immediately touted his plan on a visit to coastal areas that have been ravaged by red tide. His proposal quickly found support from business and environmental groups. DeSantis has taken other action like appointing new members to the state’s regional water boards in an attempt to remove politics from the decision making. He told reporters at the Capitol he’s following through on comments made during his campaign that Florida’s water quality issues need to be addressed. But will lawmakers go along with his sweeping plans as they craft the state budget? Part of the governor’s proposal would require the state to create a matching grant program for converting septic systems to sewer. Local governments would put up the matching money, potentially leading property owners to abandon their septic tanks. House Speaker Jose Oliva (R-Miami Lakes) thinks that might not be the best solution. “I think we have to find ways that are not a massive imposition on either property owners or local governments or the state government but is truly a combination of everyone having some skin in the game,” Oliva said at the Capitol. Plus, some lawmakers are pushing their own environmental bills that could compete with the governor’s plans. Senate President Bill Galvano (R-Bradenton) says he’s interested in an initiative out of Mote Marine Laboratory in Sarasota for red tide research, especially since he’s encountered red tide for much of his life. In other words, it’s up to state lawmakers to decide whether it’s feasible to fund the governor’s environmental budget requests. News Service of Florida and WGCU contributed to this report. The Florida Panhandle is having a rough time recovering from Hurricane Michael, and an even harder time finding ways to fund reconstruction. A group aimed at keeping reliable energy affordable has launched efforts to try and get ahead of what they believe is a bad idea. Images of bright-green water caused by harmful algal blooms have taken center stage in ecological and political conversations in Florida. This week, the federal government approved more than $1.5 billion to help fund a reservoir that will take overflow from Lake Okeechobee elsewhere in an effort to mitigate the algae’s effects. Ryan Dailey recently spoke with Florida Atlantic University’s interim director of the Harbor Branch Oceanographic Institute, Dr. Jim Sullivan, to talk algae and what the reservoir stands to do to help.